I’m super thankful for a lot. My family and friends, mother earth, animals, disc golf, music, the vegan community, the animal rights communities, and especially the people who truly look out for our environment. Happy Holocaust! and Heil Hitler! to the many millions of American’s who turned this grateful holiday into a mockery by collectively shitting on God. 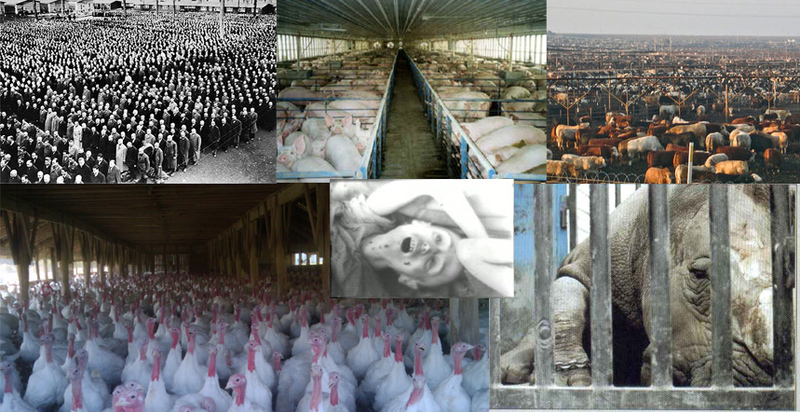 On this day of much rejoice most Americans will cherish their time with friends and family by sitting down to bountiful feast rightly knowing that from the inception of their Turkey dinner they are committing a truly horrible act of animal cruelty by subjecting their fellow Earthlings, these beautiful birds, to a life of hell that can only be compared to the concentration camps of World War II and other animal agriculture practices. For some reason people turn a blind eye, don’t care, or are to dumb to realize it. Why? Is it the government slipping drugs into the water supply or media brainwashing that is dumbing down the US population? Or has our society just given up and become this selfish evil virus of the planet that will just keep destroying itself till doom? These people’s brains actually fool themselves into thinking that they are not abusing animals and then probably go around saying something stupid like “I’m an animal lover”. Meanwhile when they have all the alternatives to stop the abuse with all kinds of amazing plant based foods, that are just as healthy if not much more healthy, they ignore that too. Why? Is it because they don’t want to lose their old traditions from the stone age? A tradition of destroying your own ecosystem with massive unhealthy animal agriculture practices and not just eating animals but putting them through life of hell and discarding their lives while playing God. Well that’s not only selfish and stupid. It’s the darkest of the dark evils. This Thanksgiving will be no different. 40+ million turkeys were presumably ran through the concentration camps never having the opportunity to live any part of a natural life and fat-headed Americans go on thinking it’s ok. I’m extremely ashamed at the society I live in. Everywhere I go I encounter these ppl and I feel sad for our planet. A preface to this: I grew up in Buffalo New York where just about every meal I ate had some kind of animal product in it. Why? I have no clue. I guess that’s just how ppl lived. When I was around 28 years old I felt I was really missing something in my life and didn’t understand what was going on around me and wasn’t happy. So I went on a a spiritual journey to really figure out what the deal was. I needed to explore my inner self and the only way I could do that is to try and attain a higher level of consciousness that I have experimented with in the past with certain psychedelic drugs. I went on a mission to find my key and after my search went unsuccessful, it was delivered to me later by a complete stranger, God’s messenger maybe..? I found what I had been looking for. It aloud me to connect to the universe in ways that just can’t be done without. It aloud me to see and go beyond our everyday reality and the world literally opened up before my eyes. During that journey I talked to God and my God ran me through many different tests that involved many different situations with many different people. I’ll save the details of the story for another time, and believe me every moment from that journey is crystal clear in my mind, but when it was all said and done I realized what was truly important in life and since then I been extremely committed to a no-suffering lifestyle and thus treating people and animals equally with much respect. One is not any better than another. And for the world to strive and for us to survive we need to stop killing and abusing each other. If you don’t agree then I only ask to please connect with your roots, your mother Earth. It’s extremely important for everything and especially to clear your conscience. In conclusion, I’d like to thank the people that have took the time to connect with their planet and done good for everyone and everything. This is our planet, we run the show, we won the survival of the fittest, so it’s time to cut the crap. We don’t have to eat animal products in every meal, or at all. I mean, one of the most beautiful and largest animals in the world, the African Elephant, is a veggy. So if anything we should learn from our animal friends, protect them, and truly cherish every single one of them. 911 Billboard 10 things I hate about meat eaters.